This is a brief overview of the sacraments which we have in the Roman Catholic Church. Are you a baptized Christian but not a Catholic? Or were baptized Catholic but never completed the rest of the Sacraments of Initiation? RCIA (Rite of Christian Initiation for Adults) is the process through which adults who seek to become members of the Catholic Church are able to do so. If you are interested, please contact Larry Fraher, Director of Faith Formation & Education, (480) 948-8370. 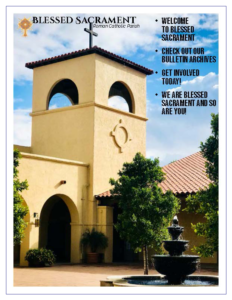 For more information please contact the Parish Office at (480) 948-8370 to get complete answers to your questions. For Funeral Planning needs, please click here for more information.